Why is fashion so appealing to us as a society? Surely, there has to be more to it than the practical purposes of modesty and protection against the elements. And for that matter, what is it that separates fashion from "mere clothing"? One possible answer is that fashion binds us to time and place, and reflects the social, economic, and political climate of the larger society. Thus, according to Charlotte Seeling, the allure of fashion lies in its ability to introduce us to "something new, always different, sometimes glamorous, sometimes shocking, futuristic one day, nostalgic the next … but never dull!" On the other hand, Cheryl Turnauer, coordinator of Harper College’s fashion department argues that "it’s human nature" for us to "want what we see people wearing on film, on television, and in magazine spreads". Additionally, young people can differentiate themselves from older generations by the types of clothing they wear, or by their allegiance to specific brands. But in a larger sense, fashion is also about masking or enhancing the wearer of the outfit. People are generally a combination of 2 or more body types - round all over, top heavy, and pear shaped – and each body type responds best to different styles of clothing. With the right combination of patterns, styles, and colors, a garment can be manipulated to meet the specific needs of the wearer and draw the eye in a way that compliments their appearance. To quote Kathleen O’Brian, a student in Harper’s fashion program in the 1970s, "fashion is so much more than something you put on everyday. It’s art." Not long after Harper College opened its doors, Elizabeth Gialdini conducted a feasibility study to determine if local companies would hire students who completed a two year fashion design program at the institution. At the same time, student counselors asked their charges if they would be interested in a career in the fashion industry. 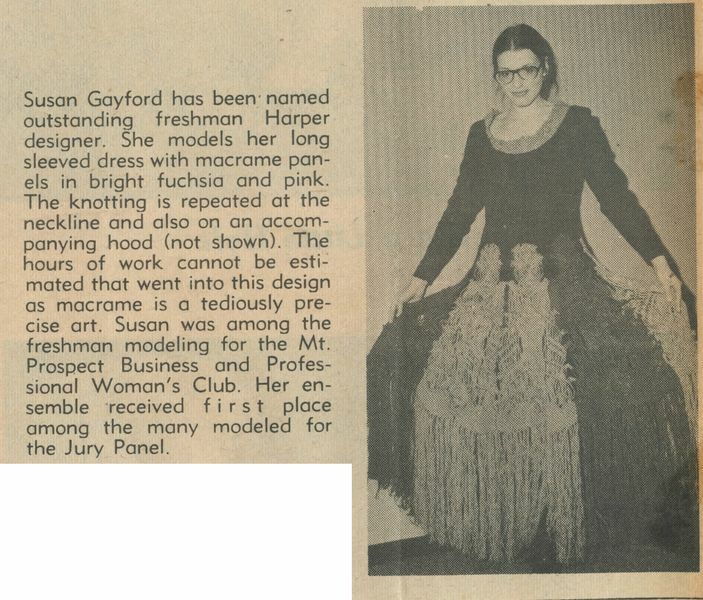 The positive responses from both camps led to the creation of Harper’s fashion design program in 1970 – the first such program offered by an institution of higher learning in Illinois. In fact, student response to the proposal was so great that although the department's coordinators intended to begin with twenty-four students, they attracted a total of fifty-seven. Naturally, this only served to highlight the lack of adequate facilities and materials. Thankfully, local clothing companies generously donated supplies to get the program up and running: ten yards of muslin; two ironing boards; six sewing machines; and two work tables. It wasn't much, but it was a good start. By the 1980s the program was benefiting greatly from its location in the Chicagoland area, where, according to a study done in 1988 by Tobe Associates, Inc. (a New York based apparel industry analyst) designers understand the demands of a less-than-perfect figure, simple but elegant taste, and the desire for quality at a price." The Chicago chapter of The Fashion Group, Inc. an international association of female executives from different segments of the industry provided Harper's fashion students a place to exchange information about trends in the field, and also compete in a fashion show where professionals could critique their work. In addition, by visiting the Chicago History Museum (then known as the Chicago Historical Society) to view its fashion history exhibit, these novices of the apparel trade learned how trends from past decades were influencing contemporary clothing styles. Such exposure helped students grow as designers and expand their creativity. Furthermore, they took it upon themselves to create the Harper Bazaar, a club where they could draw upon each other for support and stage an annual fashion show that has since become a yearly tradition at the college. With such diverse sources of inspiration and support, the program was sure to be a tremendous success. And indeed, success came in rapid fashion. 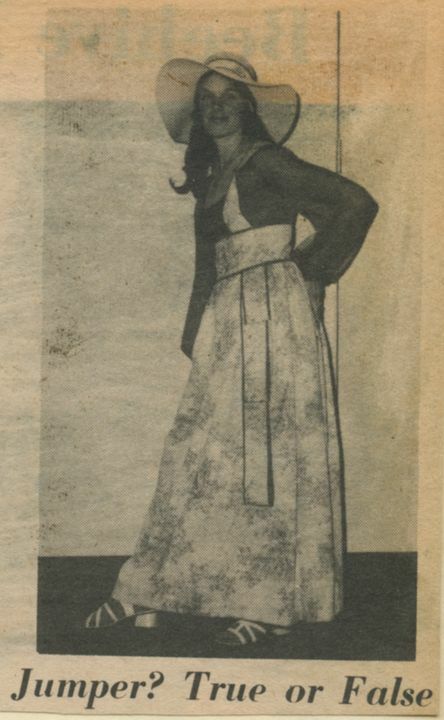 In 1983 and 1984, the Chicago area fashion shows were dominated by Harper students, who represented half of the finalists. This was especially impressive when one considers that many of the fashion shows put on in the 1980s featured well over two hundred submitted designs. By the end of the decade, Harper’s fashion program finally made its presence felt on the national stage when Rachel McAlpin was selected as one of winners in a national fashion contest held in New York. For the first time, Harper would be represented in an international fashion competition. But there was more to this event than a mere fashion show. Approximately sixty Harper fashion students took the trip to Paris to attend lectures on past and future fashion trends, and view student designs from around the world. Although Harper students didn’t win at this event, those who attended the competition certainly drew inspiration from what they saw – a vital step in their growth and development as designers. According to Beata Kania, an instructor in the program, "[t]he competition is global. That's how the fashion world operates". The fashion department opened the new decade without one of its three founding members, as Chieku Nambu had decided to retire in 1988. Yet, this didn’t slow Harper down a bit. In late 1993, Alexandra Carden was chosen to go to Paris for the eleventh annual Air France Student design competition. She took top honors in the Fashion Group Chicago regional competition, and beat out other students from around the country to qualify for this event. Alexandra became only the second Harper fashion student to appear in this relatively new show, but she represented her school well, earning wild applause from the judges for the garment she entered in the competition. And this was only the beginning. For the rest of the decade Harper students would dominate the Fashion Group of Chicago events, winning top honors six years in a row, and beating out students from at least forty other regional schools. Indeed, Harper’s fashion students became so dominant, that they won, or were finalists in, a total of eighty competitive local and regional events in a seven year period between 1994 and 2001. One of them, Maria Diamantis, even won a scholarship to study at the Paris Fashion Institute while another, Tera Wegner, won first place in the 1996 International Young Fashion Designers Contest in Paris. This was also a period of transition for the fashion program, as Sandra Clark, the last of its three original instructors, decided to retire in the spring of 1998. But she left behind a healthy department with ten faculty members, approximately two hundred full- or part-time students, and a plenty of recognition and respect in the fashion industry. Cheryl Turnauer took over the department in 1999, and under her guidance, the program continued to produce extraordinary student designers. In 2002, William Magoon-Makela won first place in the costume category at the Fashion Group International show in Chicago. The very next year, Harper’s fashion students took three of the top seven awards at the Midwest Regional Competition. A rawhide dress, produced by Megan Kearney, won her a spot as a finalist in the 2006 International Arts of Fashion competition. And, in 2009, Sabina Ajdinovic won the Fashion Group International’s annual competition along with a scholarship and chance to study in London for 10 weeks. But what really stood out during this time was the creativity involved in the production of the fashion shows themselves. By the beginning of the 2000s more responsibility was given to the merchandising students to apply their creativity towards this side of the fashion industry. The timing was fortuitous because the department had just hired Neil Tufano – a technical specialist – to help the students focus on staging and other logistics. Additionally, the students were beginning to think outside the narrow confines of their department, and sought assistance from other programs at Harper College to produce the fashion shows. The results spoke for themselves. Whether they were trying to simulate a scenic walk through Central Park or recreate the Garden of Eden, Harper’s fashion students created atmospheres as pleasing to the eyes and ears as the garments on display. The 2004 fashion show, named "La Piazza", was a perfect example of this new orientation. Students wanted the proceeds from this show to go to a safe house being built for victims of domestic abuse, and incorporated this larger goal into the their designs for the set. So while the show recreated the feel of an Italian marketplace, the students selected colors and props that would reflect the inner strength of those women who have survived their ordeals. (For a behind the scenes look at the production of the 2004 fashion show, please click here.) Soon, the layout of the fashion shows became as big of an attraction as the garments on display, and people began flocking to the annual event, drawing several hundred to several thousand people each year. The fashion program continues to thrive, thanks to the creativity and ingenuity of its students and instructors. And even though Cheryl plans to retire at the end of the fall 2014 semester, the past four decades seem to indicate that the future will remain bright for these up and coming superstars of the fashion industry. If you are interested in pursuing a career in fashion, check out the Fashion Design and Merchandising Department's website for more information! You can also view the department's Fashion Sketchbooks to get an idea of what you will learn in the program and see examples of garments designed by students. The 1970s was a decade of fragmentation for the United States. The economy collapsed, the country was divided over Vietnam, and the Watergate scandal destroyed the nation's trust in their elected officials. At the same time, young people, especially women, were rebelling against a system they thought was oppressive and unfair. This rebellion carried over into the world of fashion, bringing with it a rejection of clothing trends from previous decades. In the words of Charlotte Seeling, "[f]ashion - like life in general - was no longer subject to fixed rules; everyone could dress in what suited them." The result was a mishmash of patterns and fabrics meant to express the wearer's independence. In the 1980s, American politics shifted to the right with the election of Ronald Reagan as President. His economic policies put more wealth into the hands of the middle and upper classes, and they responded by spending money on clothing and other consumer goods that would symbolize power, wealth, and status. But with the rise of conservatism and consumerism came a rejection of more liberal styles of clothing from previous decades. Now, garments had to be glamorous and expensive. Men and women's styles were fairly uniform during this period. Work garments, like suits and dresses, had broad shoulders with deep, long lapels. For casual wear, both genders tended to mix and match garments to obtain the look they wanted. Informality was the fashion theme of the 1990s. To improve morale, businesses relaxed their dress codes and allowed workers to wear clothing that still appeared professional, yet was not as stiff, formal, or expensive as in the previous decade. This spurred the growth of a new market for “business casual” attire. At the same time, however, retailers suffered as people spent less money on clothing and globalization introduced Americans to garments produced outside the country. To stay competitive, domestic designers began creating individualized styles for consumers by paying more attention to the tastes of minorities as well as incorporating elements from other cultures into their designs. Colors were generally muted or neutral for the first half of the decade, until experiencing a revival in the second half. Americans faced an uncertain future as they entered the 2000s. People were afraid that the nation’s technological infrastructure would be unable to handle the transition to the new millennium. The economy slid into recession with the crash of the dot-com boom and revelations of major business scandals. And the presidential election that began the decade threatened to drag on with no end in sight. When September 11th happened, the government developed new programs and organizations that tried to protect us from foreign and domestic threats, but also threatened our liberties. This was a very insecure age, in which people longed for comfort and simplicity, and deeper connections with other people. To that end, garments featured bright colors and tended to reinforce gender divisions. Concurrently, there was greater diversity in body shapes than ever before, especially with the rise of obesity in the population. Fashion designers responded by creating garments that were asymmetrical or had mismatched proportions. This gallery is a behind the scenes look at the creation of Harper College's fashion show in 2004 from the perspective of Victoria Lobanok, a student in the fashion design program who helped put the show together. The theme of the 2004 show, called "La Piazza", was based on Italian architecture. To inspire her students, Cheryl Turnaeur went on a trip to Italy and brought back photographs of buildings, arches, and old streets. She was assisted by fellow fashion instructor, and technical specialist, Neil Tufano. January 26, 2004: "Neil showed the class how the wooden crates and the fake bread were going to be made. Then ... [he] had the class cut out squares from cardboard with a box cutter. Cheryl gave the class a list of supplies that we were to get at the dollar store, and then we just signed our life away to the class." February 2, 2004: "Today the projects began. ... There are going to be tubular and [square] shaped columns, which are about five feet in height. We had to measure the length and width of the top and bottom of the column and make bases for them [which] were glued together to create a texturized three-dimensional [look]." February 9, 2004: "The students were divided in half, some for cutting and some for painting. ... Neil got the group going by switching cutting tasks, so no one got bored quick. One group cut out and measured squares and circles for the columns, and then the pieces were stapled and glued together. Across the way, Cheryl and her crew painted rocks on a big fabric piece [which will] be the skirting for the runway stage. The students used several colors to get the full effect of the rocks texture. The class worked really well as a team and got a lot accomplished." March 1, 2004: "Today was paint day. ... Since all the columns were finished and painted white they were ready to be texturized. Cheryl showed the class some pictures of a Calvin Klein add that had a rocky/stone background. We used multiple colors to create this effect ... such as: black, white, light and dark browns, yellow, orange, beige, and gray. To produce the texture the colors were smudged and blended onto the column. A couple of students used cotton swabs to draw thin blended lines all around the columns, to give [them] the crackling effect." March 15, 2004: "Cheryl began working on the light posts and the shades that go on top. Some of the students were asked to paint ... them white [on the inside]. Their three dimensional shape was ... square and [they] had an abnormal shaped cut out [on all four sides]. When the bulbs are put in, the light will come through the cutouts." April 5 through 19, 2004: "[T]he class had been working on getting the walls completed. ... They were made in different shapes and sizes to reflect the originals and no two were the same! ... A lot of them required extra plaster in order to create the full effect. The plaster was [created] by soaking shredded paper in water, then draining it in the sink, and attaching it ... to the walls. ... Neil also added a fruit painting to the white wagon[. H]e did a really good job on it." April 26, 2004: "Today the class painted small, flat, three-dimensional sculptures that were going to be mounted on green buckets. We had to mix the forest green color with water in order for it to go on more smoothly. When they all dried, we added a bronzing effect as a top layer to give it a rusty illusion." April 29, 2004: "The day of the Jury Show. All designers, dressers, and models were to arrive at 7 am. The room was filled with ... many garments designed by students. The designs were to be presented to a group of judges who would then decide which of [them] can be presented in the fashion show. ... [T]he models can dress in one room, walk through the jury room, present the outfit, and walk out and come back in through the back. The students had to wait two hours before the judging actually began at 10 o'clock. ... The show moves so fast the models need help getting in and out of the clothes without damaging them. Plus the dressers [kept] the models and their garments in the right [numerical] order, which was very crucial in this show. ... [T]he designers ... put a lot of work and creativity into their creations, and although they were all nervous and anxious to find out the results, they were all proud of their work in the end." May 10, 2004: "When I registered for this course, I really didn't know what to expect. In the end, I really didn't think of it as a class but more of a fun project. ... I imagined this to be an [ordinary] project and it was so much more than that. The instructors ... did a great job motivating the class to be inspired by the Roman architecture ... [and] the teachers worked just as hard as the students to make this show happen. ... This class was a great opportunity to [learn about] creativity, imagination, and teamwork. It is interesting to see bits and pieces come together to construct and produce an incredible final result - La Piazza!" On your website (www.wandacobar.com), you mentioned becoming interested in fashion while bedridden following knee surgery. What was it about fashion that interested you so much? I have to say that it was the Versace ads in Vogue magazine that caught my eye. My mom was a seamstress growing up. She used to make all our clothes and school uniforms but the clothes did not look as elegant and as fashionable as the ones I saw in the magazines. I also loved the fashion photography. Did you know right away that you wanted to pursue a career in fashion, or did something happen to lead you in that direction? No I did not. I actually did not know what I wanted to do after graduating high school. I got interested in fashion just simply looking at fashion magazines while recovering from knee surgery. I did always like art and my favorite subject in high school was drafting but never really thought about pursuing it as a career. Why did you decide to study fashion at Harper College? How did the college’s program at the time compare with those of other local and national schools? When I was going to Northwestern Business College for Fashion Merchandising my teacher took us to a student fashion show competition and almost every single student that was winning that year was from Harper College. I remember telling my teacher right then and there that I wanted to study fashion design even though at the time I did not know how to sew. So she was nice enough to take me to visit some of the Chicago downtown schools and I told her that I would like to visit Harper College. At first, she was a bit hesitant because she felt it was too far for me to go to school since I lived in the city but I reminded her that most of the winning students were from Harper so she took me to visit the school. I really liked the program at Harper the best because the program seemed to focus mostly on fashion and art. The downtown schools for some reason didn’t appeal to me especially when I saw how much tuition was. I honestly could not afford it and I did not want to take out another student loan. Plus when I walked into Harpers fashion classroom there was a student working on a beautiful garment that just blew me away! I didn’t see that at the other schools. Then when the director of the fashion program told me how much tuition was I was sold! ;) She explained to me that I could get a chargeback from the city to pay the in-district rate at Harper College. It worked out perfect! Plus I had a car so travel to school from the city was not as bad as I thought and I got to bring my own sewing machine to class. I am not a big fan of taking public transportation in the city so it was nice to go to school in the comfort of my own car listening to my own music. I do have to say that when I signed up for my classes at Harper, a school counselor told me that Harper does not teach sewing so I had to learn on my own but encouraged me to still take the classes because I already had drafting experience to take the basic pattern making classes while I learned how to sew somewhere else. It was not easy at all but I was determined to learn. Was there any particular part of Harper’s fashion program that you found particularly interesting, fun, or helpful? I would have to say that I enjoyed every single fashion program at Harper because I was eager to learn everything! We did have a costing class and that was super helpful in learning how to break down the cost of each garment and that is helpful when you are designing garments that will be for sale. In 1998, you were selected to participate in an international fashion competition in Paris. How do you feel your classes at Harper prepared you for this event? What were the differences between international fashion shows, such as this one, and those you participated in at the local or national levels? I was able to go to Paris because of Harper College so all my teachers were very helpful in preparing me and making sure that what I was designing a garment that fit the Paris competition requirements. The difference with the Paris fashion show and a local show was obviously the people I was competing with, there were students from all over the world so I got to see some of the garments backstage and I can tell that some had much more advanced skills in patternmaking and design. The show was very high quality with high fashion models but I do have to say that the fashion shows Harper put on at the end of the year were just as amazing! We used professional models with an awesome sound and stage system that presented the students garments very well. In 1999, you got to study fashion at American Intercontinental University in London. What did you learn there, and how did it build on what you learned at Harper? I took 2 classes in London: Trend Forecasting and History of British Museums. My Fashion Costume History class at Harper really opened my eyes to seeing fashion in a different light, it was interesting to learn about how events in history would affect the way people dressed over the years so when I was looking at paintings at a museum I was able to somewhat tell what era that painting was from just by the way a certain person in the painting was dressed. Harper was very good at keeping us updated on what was happening in the textile industry and as a matter of fact Harper brought in a vendor that sold this unique plastic material that I ended up using for my Paris competition garment. Fashion can be so simple and complex at the same time. Technology was becoming big in the apparel industry with new ideas for materials and new shapes and but at the same time many designers look back in time for inspiration which helped me in my Trend Forecasting class. My teachers at Harper College were so inspirational to me and I really looked up to all of them. They taught me to think outside the box and be open to all types of art and fashion so I was able to build enough confidence to go to a different country to live and study. Where have you worked since graduating from Harper’s fashion program, and how have your courses from Harper prepared you to excel at those jobs? After graduation I went to work for a prom dress manufacturing company called Alyce Designs shortly after that I went to work for another company called Amerex Kids Group that had the license to design under the Osh Kosh label. I was also hired to work part – time for a fetish company working with leather and suede goods. A year later in 2000 I was hired by a high school to design their dance costumes and I have been their costume designer ever since. Currently I work for a company called Chicago Scenic Studios that has an amazing sewing department that I have access to everyday. Going to Harper gave me the confidence and the drive to succeed in whatever I did. The teachers were also artists themselves so they had the experience in the industry and would tell us their stories that was so refreshing to hear because there are ups and downs in life and no matter what they never gave up. I also made incredible friends at Harper and I ended up getting 2 of my jobs listed above thru them. Any final words for those who are involved in the program now, or might want to be in the future? Learn as much as you can in all aspects of fashion including the business side, ask questions and never give up because your passion will open doors for you especially when you least expect it. My Mother taught me to sew at a very young age. She would purchase commercial patterns from our local fabric store and I would customize them by changing the shape and/or by altering a detail. Every garment I made was slightly modified from the original purchased pattern. I have always loved fashion. I knew at an extremely young age what I wanted to do when I grew up. I designed and made both my junior and senior prom dresses. My mother found the Harper College program for me. She was a single mom with two kids, so we didn’t have a lot of money. The program came highly recommended. Our local junior college, Elgin Community College, didn’t have a fashion program, so I was able to receive an out-of-district waiver for my tuition. Harper students’ competed against students from some of the top Fashion Colleges: Fashion Institute of Technology, Art Institute of Chicago, University of Cincinnati, etc. The Harper program was intense. The drop out rate was high after the first semester. The teachers were passionate about fashion and their enthusiasm fueled the motivation of the students. If you wanted to succeed in the program, there was no slacking-off. While studying at Harper, did you win any kind of awards or recognition for any outfits you designed? One of my garments represented the school in New York at the International Competition of Young Fashion Designers sponsored by Air France. I also had several garments selected to compete in the annual Fashion Group International design competition. I have worked at the following companies: Eddie Bauer, Nordstrom, Levi’s, Zumiez, & Amazon. I have worked in the fashion industry for nearly 20 years. If the program is anything like it was 25 years ago, I would highly recommend it. However, I do recommend continuing on with higher education and getting at least a bachelor degree. It has benefited my career to have both an Associate in Applied Science Degree (in Fashion Design) and a Bachelor degree (in Clothing & Textiles). Ive always been interested in art and fashion. My favorite part of Cinderella was when the mice made her dress. Watching Pretty in Pink I loved the part when she made her own prom dress. My mother always made me and my sisters our clothes and I loved watching her. I knew in like 5th grade. I started drawing dresses and thinking how I could make them. I was injured in a car accident at the age of 13 and was paralyzed from the chest down with limited hand function and so I thought my dream was over and I would not be able to design. The fashion teacher at Palatine High School (Sally McDavid, she now is an instructor at Harper) helped me find a sewing machine I could operate without using a foot pedal… and that was it! I was back on track! I initially decided to study at harper because I didn’t feel ready to leave home for a 4-year university and I also wanted to save money. When I found out about the fashion program I was really excited because I had heard really good things about it. I was really proud of being where I was because we had great instructors and our program was comparable to those of SAIC and Columbia. In fact, we often won at competitions against them. The staff was great at helping adapt anything necessary so that I could participate with the other students. I was the first student in a wheelchair to go through the program so I think they were nervous about my needs but even so were open to meet my needs. It was life changing for me to travel to Paris to the AirFrance competition. I was able to visit many places I had only read about in books like the Louvre. It also gave me confidence to travel internationally in a wheelchair. I designed several collections for the fashion shows at Harper and was part of the planning committee. In 2001 I was a Costume Design Finalist at the Fashion Group International competition in Chicago. Where have you worked since graduating from Harper’s fashion program, and how have your courses from Harper prepared you to excel at those jobs? Have your courses from Harper helped prepare you for your current work with Backbones? I continued my studies in Theatre Arts at the University of Arizona and designed costumes for theatre and dance—Borderlands Theatre, Hubbard Street Dance, Luna Negra Dance, Dance Detour, Bodies of Work, DanceWorks Chicago. Learning about patternmaking was really important to be able to adapt my designs to the needs of dancers. Also, being knowledgeable about different properties of fabrics and textiles was important because certain fabrics lend themselves to the stage- more breathable and ease/comfort for dancers and actors who need to move a lot or do quick costume changes. Illustration classes were essential in my communicating with other theatre artists or clients. I could discuss and modify designs visually and the whole team could picture what it would look like. I really came to understand the body and that was helpful in peaking my interest about anatomy, movement. It has been really helpful when working with people with spinal injuries and also creating fact sheets and learning charts. My experience at Harper has also helped me when I share information with others with SCI who are looking to go back to school after their injury and are scared or intimidated. Planning and deadlines have helped in my event planning with BACKBONES too. It is a very well rounded program with excellent instructors and individual attention. I have always been interested in creating and I was making my own clothes. Did you know right away that you wanted to pursue a career in fashion, or did something happen to lead you in that direction. 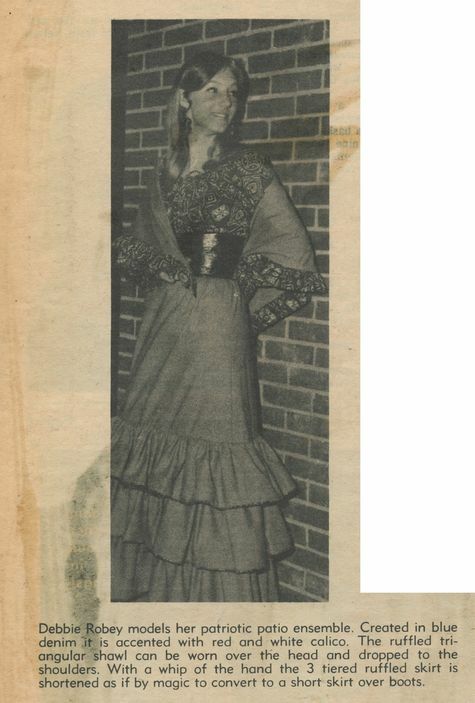 I became interested in fashion when I was a seamstress in the costume department at the Gutherie Theater in MPLS, MN. I decide to study at Harper College, because it was close to my home and it was affordable and I liked what I saw in the program. I loved all of my teachers and fellow classmates. I really LOVED the workroom and often fantasize about those long wooden tables. I would love to be able to work in that room now. When I finished up at Harper I began working with several fabric reps, I eventually became my own boss and am now a quilt designer and teacher. I travel around the world teaching my unique form of fused quilting and machine quilting to students. I have my own pattern and hand dyed fabric business, you can view my work and products on my website at http://www.friesytle.com. My original quilts have won numerous awards. I think the most important lesson I learned while at Harper was excellence, the quality of workmanship. I can still remember being told to rip out a top stitching seam and do it again, or remaking flap pockets over and over again until they were perfect. These are valuable lessons. Talk to an advisor and figure out the best course of action for you to take in this wonderful program. I learned so much about fashion and design and myself at Harper. I had a great experience there. Beck, Jane, and Jean Louise Parsons. Twentieth Century Dress in the United States. New York: Fairchild Publications, 2007. Print. Seeling, Charlotte. Fashion, 150 Years: Couturiers, Designers, Labels. Potsdam: H.f. Ullmann, 2012. Print. Steer, Deirdre. Costume since 1945: Couture, Street Style, and Anti-fashion. New York: Drama, 1996. Print. Cheryl Turnauer and Franca Deflorio for donating the records of the Fashion Department to the archives and providing so much incredible background information about the program's history. Wanda Cobar, Christina Draper, Reveca Torres, and Frieda Anderson, who graciously allowed me to interview them about their experiences in the fashion program. Zaray Buenrostro for picking out several garments and video clips for this exhibit. David Sullivan, who quickly and efficiently scanned materials so that this project could be finished on time. Jessica Mandra for uploading the video files to Harper College's Youtube channel. Matt Nelson, who designed the "Fashion Through the Decades" banner. And last, but not least, K. C. Babb for helping me navigate the difficult terrain of web design to make this exhibit look clean and consistent. This exhibit was designed by Martin Firestein, Harper College Archivist, ©2014. All images, videos, and sketches featured herein belong to the Harper College Archives. To use them, please send an email to archives@harpercollege.edu.